I will probably have to back out. I’ll know by tomorrow. Out - doctors orders. Was looking forward to do this run so bad. Next time for sure. I am leaving from Phoenix on Saturday also. Let me know what time you are meeting and I will be there. Loves or the QT. Either one works for me. I’ll have small AZFJ stickers for 3$ (not UV rated and not recommended for trucks but great for water bottles or CO2 tanks, etc) and OFFICIAL BOARDER RUN 2018 patches for sale for 8$. All profit will go towards re-ordering proper AZFJ stickers as the remaining have been lost in a USPS accident. AZFJ regular patches are $5. Any profit above funding new stickers goes towards whatever charity or worthy cause comes up eventually. (Donated almost 1000$ together to Crown King FD and between us and sticker sales we handed over about as much towards Duners final expenses. I’ll do my best to have change available but bring exact cash if you can. If you just want to make a donation in general then I’m sure other AZFJ members would greatly appreciate finally getting a sticker and or whatever worthy cause deemed fit would be great full. I don’t make a single penny off of any AZFJ stuff and don’t mind continuing to run it as long as it only costs me my time and effort. If you can’t make the event I do ship but first dibs will go to event attenders, then I’ll mail one to Connie, then first dibs next week. Unique boarder run 2018 patches limited to 60 ever so this weekend will be your chance to get one. 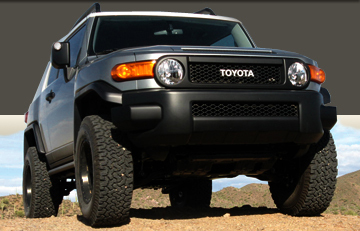 I’ll be the teenager in the big red FJ. Likely wearing a bucket on my head. If you miss me you probably should get some glasses. Unfortunately, I have to back out for the run. Add me to the out list. Annette had to leave town and messed up our plans. I know y'all will have a blast. Hopefully someone who has never done the run can join. I looked at the path and the time. Google Maps says that it will take 1.5 to 2 hours to get to our destination on Saturday morning from 7001 W Sundust Rd. I personally do not like to be rushed. If we could meet around 6:45am we would have 45 to 15 minutes of spare time to get Gas in Tucson. There is a Fry's fuel center just north of our destination @ 8260 S Houghton Rd or there is a Costco @ South Kino Pkwy and E Ajo Way to get gas. I would propose that those of us that want to meetup on Saturday in Phoenix to go down, should meet at the Loves @ 6:45am and make sure we leave by 6:50am. Do they have better prices than Fry's? I tend to goto Fry's or Costco unless I am not near either. Hey Gilbert for the ease of getting in & out quick for Gas quick I would stay away from the Costco its a goofy shopping center to get in & out of & for the fry's it will add a extra 10+ minutes out of your way, Jim's suggestion for the Pilot is okay but you know how crazy Truck Stops can get. I second Les'z assertion. That's a good stop too.